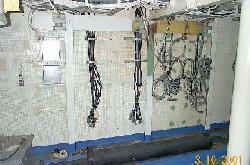 FACCON 2 - (Facilities Control 2 ) which was the 1980s Cryptology Room when the ship was active. BNJARS radio station is located in FACCON 2. 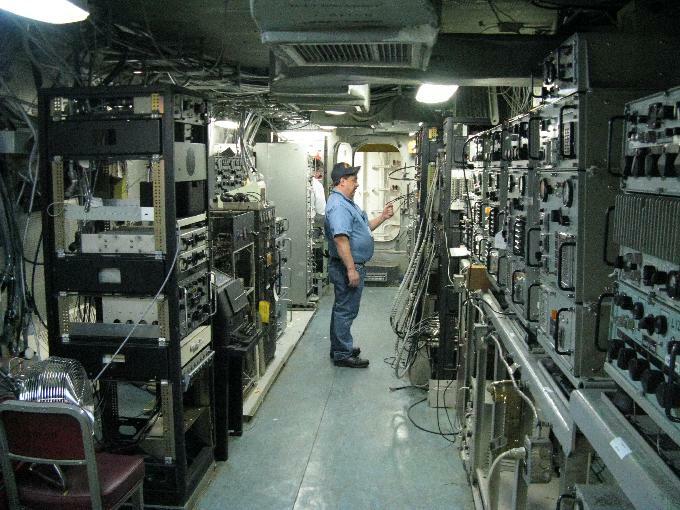 When we arrived on the ship in January 2001 this room had been cleared of all equipment and seemed the best place to put the NJ2BB station. In May 2001, with the permission of the HPA (Home Port Alliance) who manages the ship as a museum, we set up 1 station in FACCON-2 just in time to celebrate the ship's 58th Anniversay of its commissioning. We were privileged to have one of the original 1943 radiomen, Bob Westcott W2MAS, on board to make the very first transmission from the ship using the call sign NJ2BB. It was a thrill for all of us to listen to that first contact. 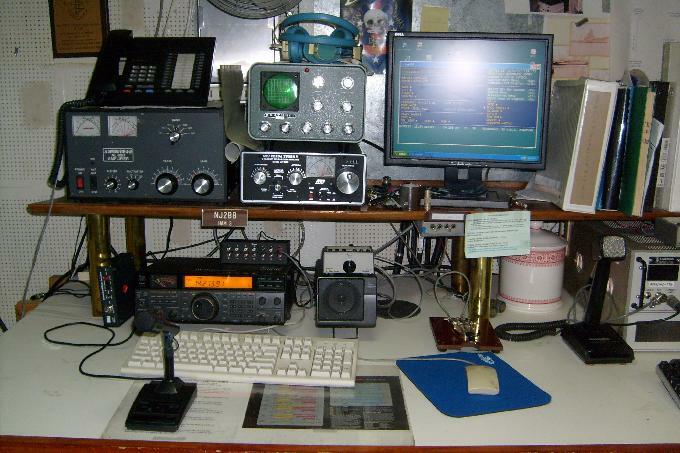 Since that first contact, the shack has grown from one station to several, covering many aspects of the hobby. HAM-1 - Located in the center of the publicly accessible Message Handling Center (Comm Center) this operating position is not assigned any permanent equipment. It is used for special operating events where the public can view and hear the station as they take a tour of the Comm Center. HAM-2 - Using a Kenwood TS-570D HF transceiver and a RigBlaster interface, HAM-2 is used for CW, SSB and any of the digital modes. 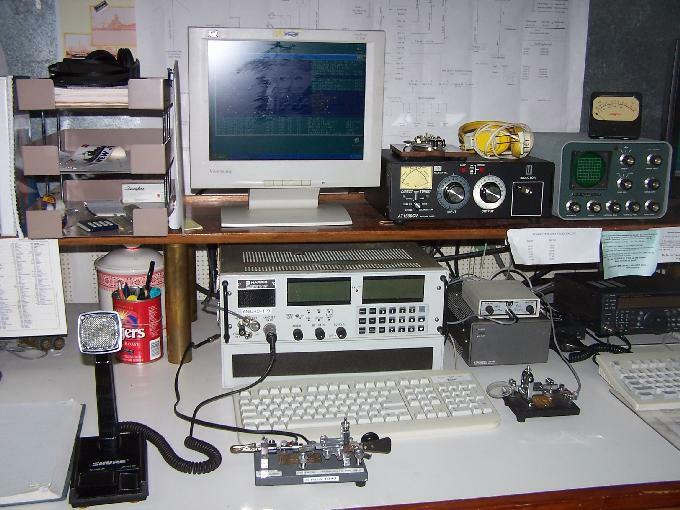 PSK is the usual "mode of the day"
HAM-3 - Located to the far left of the Ham-2 operating position, Ham-3 consists of an Icom IC-736 HF transceiver, Ameritron AL-80B amp, MFJ Versa Tuner V and a Heathkit SB-610 monitor. This position is the daily favorite for the SSB ops. We haven't used the Ameritron much, thanks to the great antennas on the ship. For the eagle-eyes readers, the telephone on top of the amp does not normally reside there. The rig and amp were donated by the family of a local silent key. 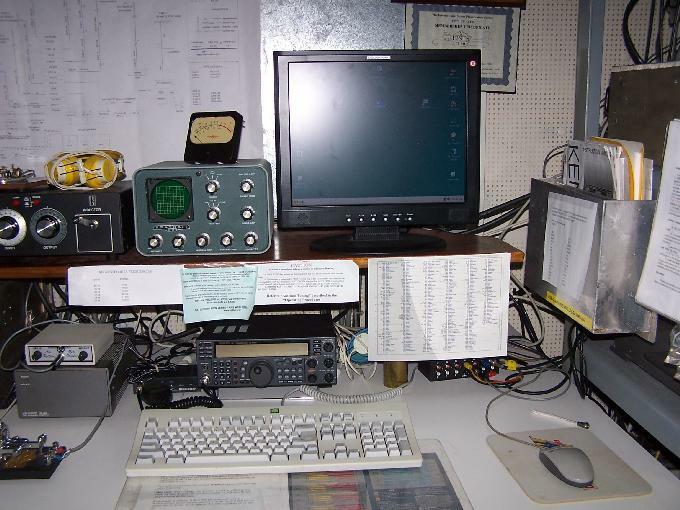 HAM-4 - Ham-4 is located inboard of the Ham-2 and Ham-3 positions and consists of a Kenwood TS-570D HF transceiver and a Heatkit SB-610 monitor. Located on the VHF shelf above the TS-570D are a Heatkit 6-meter all mode transceiver, Yeasu FT-736R transceiver for satellite contact and an Icom IC-271H 2-meter all mode transceiver. Hanging under the shelf is a Clegg FM-28 used for simplex contacts, a Kenwood FM ??? 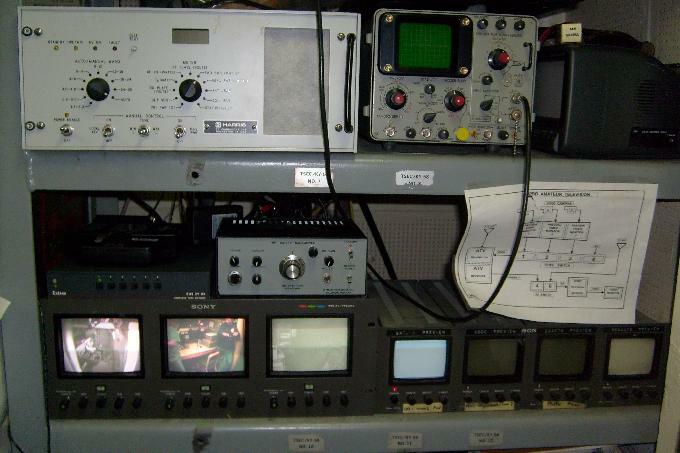 that monitors the local 146.82 repeater and a Kenwood ????? used to wake other local FM repeaters. Not in position when this photo was taken is the Icom IC-471H all mode used for 70cm contacts. HAM-5 - Located between HAM-2 and Ham-3, our newest operating position consist of a donated Harris RF-350 (AN/URR-119) military HF transceiver. 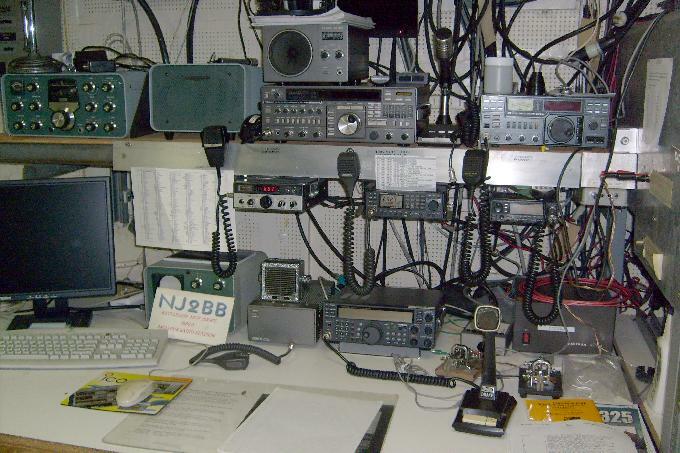 This all mode rig provides us with 100-watts of military operations from the NJ2BB shack. Located on the shelf to the right of HAM-2 is a donated 500-watt Harris amplifier. This amp is remote controlled by the RF-350 and also provides for automatic antenna tuner functions. Located forward (right side) of the Ham-2 operating position is our collection of ATV gear. Cameras installed in some of our spaces drive the monitors. The ATV transceiver is sitting above the third monitor. Next to the transceiver is the 8-button source switch. The o'scope above is for monitoring the RF signal, much to the delight of visitors. The large box to the left of the scope is the 500-watt, remote controlled, auto tune amplifier used with the RF-350 transceiver at Ham-5. All amp functions and measurements are displayed on the RF-350 front panel display. Also located in FACCON 2, but not given a name, is a collection of 2-meter transceivers used for Packet, DXCluster and APRS operations. Using Azden PCS-3000 rigs, this section of equipment operates 24/7, not only because of the nature of the modes but also because the output of the associated PK-232 TNC sends information to NAVMACS (Naval Message Automated Control System) displays in the Comm Center and other parts of the ship. These displays are one of our many attempts to give the ship a "working look". The starboard 35' VERTICAL can be accessed but this action removes this antenna from the receiver antenna coupler used by the ships HF recievers. The VHF compartment located 2 decks above the Radio Room contains some of the original VHF gear. An AN/VRC-46, designed for 30 to 70 MHz FM, has been restored to operation for the Ham 6-meter band. Today this compartment is an office which offers us limited access to work on the gear. Originally the '46 was operated remotely from elsewhere in the ship. In the future these lines will be restored to service and the '46 will see more service. The ship's Transmitter Room is not available to visitors or guests, yet. 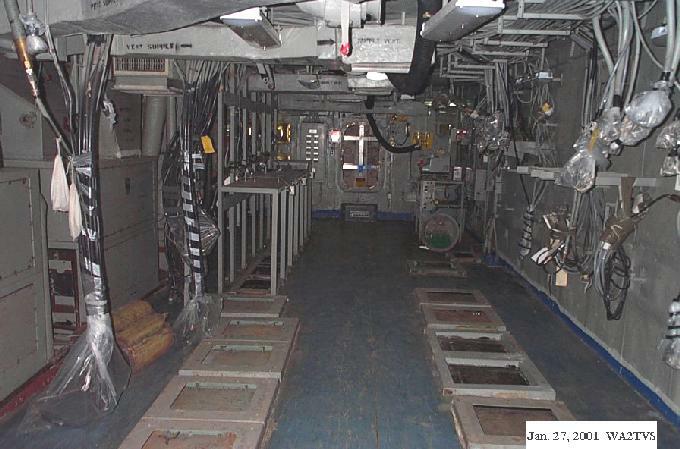 When first discovered in January of 2001 this compartment was completely empty, except for equipment mounts and interconnecting cables. Located on 3rd deck, two decks below the NJ2BB shack, this space is now home to several military transmitters that are in various stages of restoration. Three AN/URT-23 transmitter once again grace the stands that once held 11 of this 1500-watt, all mode HF transmitters. Currently two of them are usable by members. A WWII vintage TCK 400-watt HF transmitter is fast approaching its debut on the Ham bands. Sitting next to the TCK is an Army T-368 transmitter. This AM/CW rig is also nearing completion and use on the Ham bands. Our newest donation in this compartment is a AN/WRT-2 HF transmitter. We are still in the process of installing this rig. It needed to be disassembled down to the module level in order to be lowered into the lower decks of the ship. The ship may be large, but the hatches and doors are still limited to a width of 25". Operation from this compartment is more sporadic than anything but should become more frequent as the transmitters are debugged and stabilized.